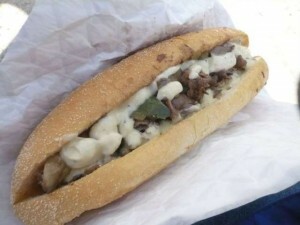 Bada Bing, one of Vancouver’s new food carts, features Philly Cheesesteaks. Delicious Philly cheesesteaks – thinly sliced beef sauteed with mushrooms, onions, peppers and loads of monterey jack cheese ($6.99). The food is decent – but it’s not huge or anything. The sandwich is a footlong – but it’s not loaded heavy; which is a shame because the ingredients are good and the filling tastes great. At the Bada Bing food truck the tax is not included in the listed price – does that seem weird and very unlike street food to anyone else? So…..yeah it comes to $7.83 . Eight dollars for a sandwich? EIGHT?! Are you freaking kidding me?! That’s the worst garbage food deal I’ve ever heard! Fine, maybe if it’s the biggest, greatest sandwich of all time ever that you could split between three hungry people, it would be a reasonable deal. But it’s not. Yes, the food tastes really good – SO – if this sandwich cost two dollars I would buy it every single day. But it’s eight dollars so I will only get it once in my entire life. The mediocre selection of condiments sure doesn’t make up for the price either –> pickles, jalapenos, and an assortment of sauces. Sure, you could go the cheaper route and get the chicken sandwich ($5.99) – but it’s called a Philly Cheesesteak NOT a Cheesechicken. And you’d still end up paying almost seven dollars for your miserable cheesechicken anyway. So, why the high prices? It must be because they need to pay off their super food truck. It’s about as big as my apartment and it looks like it could be the tour bus for Edward Sharpe and the Magnetic Zeros. It’s ridiculous. Didn’t these guys get the memo that street food is supposed to come from a tiny tin cart that you can push down the sidewalk? Guess not. Or the memo that street food is supposed to be $5 or less? Nope, they must have missed that one too. The only suckers Bada Bing be getting with this over priced food truck are tourists. 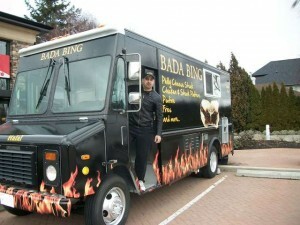 Lucky for Bada Bing they are set up on Robson and Bute. They’ll manage to get that van paid off soon enough. Uh – they also have poutine, fries, and rice bowls. But after paying $8 for a sandwich I didn’t really feel like spending anything more. This entry was posted in Food and tagged bada, bada bing, badabing, bing, bute, cart, cheap, cheese, cheesesteak, chicken, dinner, downtown, expensive, food, food cart, food truck, halah, lunch, philly, robson, sandwich, steak, street, truck, Vancouver, westend. Bookmark the permalink.